Today, it’s hard to imagine life without computers & internet, more and more people are storing some of their most valuable information in digital format, even online. So, it is even harder to imagine living a digital life without the protection of internet security software. However, there are a number of internet security vendors providing various kinds of services from separate protection such as password management, traffic firewall or log analysis, to all-in-one security suite, plus some technical stuff like conflicts and compatibility, finding specific, helpful and correct information of the perfect protection you need can be really difficult. Our goal is to educate you on exactly how to choose the best security protection for you, and to explain the pros and cons. We will provide some test results by some authority sites and also share our user experience on several products of the leading internet security providers. OUR TIPS: Read Our Reviews, and have a free trial by yourself before you pay to see if you are liking it and if it works fine with the other software running in your system. Why Internet Security Software Suites? For ordinary user, we always recommend internet security suite, which provides all-around protection. One may think a good antivirus software is enough — but viruses are far from the only threat your PC faces. There are hackers, scammers & advertisers who are seeking to spy on you, scam you or make use of your personal information to make money. There are also threats from spyware, adware and other malwares. This is why you need a full security suite. Good internet security software suites offer additional protection besides antivirus, such as firewalls, HIPS features, warnings about phishing sites, and sandbox environments, etc. Some products such as Bitdefender Internet Security 2016 is even integrated with functionality of password management. antivirus software & internet security suites, it makes sense to pay a little more for the more comprehensive protection features. And in most cases, top security vendors usually offer bigger discounts for new launched internet security products to grab more market share. For instance, Kaspersky Internet Security 2016 costs the same with Anti-Virus 2016 now with $20 off. 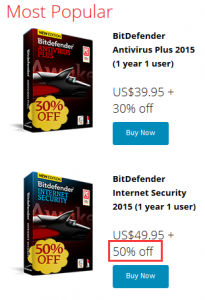 And in a 50% crazy promotion of Bitdefender Internet Security Suite 2016 is even cheaper than its Anti-Virus product. Our expertise team have reviewed some of the most highly famed and awarded internet security software products based on authority tests & ratings, pros and cons, help & support, customer reviews, complaints, and more, to elaborately select the best of the best for users who are seeking the perfect cyber security & privacy. What to look When Choosing a security protection? A good file detection rate is always one of the most important, deterministic & reliable basic features of an anti-virus products. Best internet security software should have a very high detection rate as well as a very low false alarm (false positive) rate. In the famous third-party AV-Comparatives Test 2014, Kaspersky ranked #1 with 99.8% detection accuracy, F-Secure ranked #2 with 99.6% accuracy, while Bitdefender ranked #3 with 99.5% accuracy when detecting 125977 malware samples collected up to the 21st, February 2014. What is impressive is Bitdefender also has a very low false alarm rate (only 3 false positive samples). Kaspersky has 9 false positive samples, which is a little higher, but also good considering its super high detection rate. Nowadays, firewall is a necessary module of all internet security suites since it is almost impossible to find a computer that has no connection to the internet. In AV-Comparatives Test 2015, experiments are conducted to evaluate firewalls of top security products in both private and public network environment, expecting they can block connections such as Ping, file sharing and remote desktop in public network, while allow these connection requests in private network. 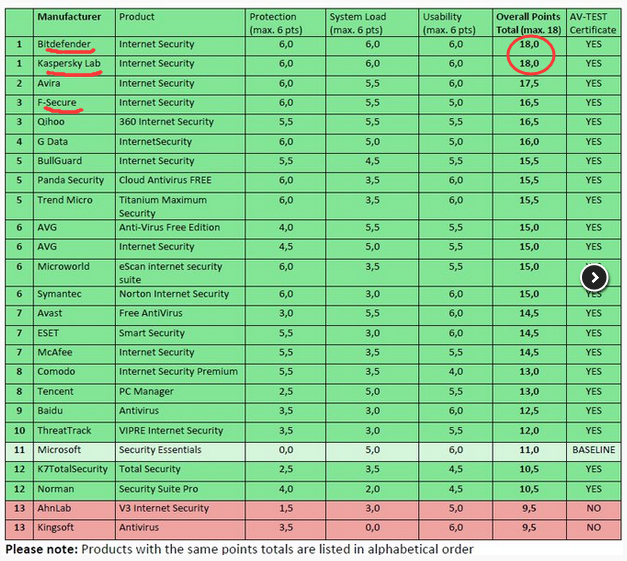 As a result, only 5 products react 100% correctly in these tests, Bitdefender, Kaspersky & F-Secure are among those best ones. Our TIPS: Though windows firewall performs very well in these tests, we still strongly suggest use a good third-party firewall because windows firewall does not restrict outbound connections by default and hard to be configured properly. Our TIPS: There are some famous free firewall, such like Comodo, which has achieved impressive performance in AV-TEST, but it is too complicated for ordinary users. So, we only suggest users with related technical background consider Comodo. Many new malware samples appear every day, so it is very important for antivirus products not only provide new updates, as frequently and as quickly as possible, but also that they are able to detect such threats in advance with generic/heuristic techniques. Proactive Defense is just the ability to act in advance to oppose an attack against computers and networks, rather than scan & repair after your computer has been compromised. It has become a very effective way to deal with new virus or other security threats that has not yet been seen and learned by anti-virus programs, the so called zero-day-malware-attack. 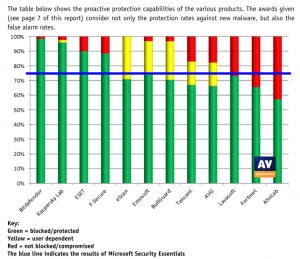 Proactive defense is one of the most featured module of Bitdefender, in the famous Proactive/Behavioral Test 2014 by AV-Comparatives, which used 1,200 new unique and very prevalent malware samples that appeared for the first time shortly after the freezing date, Bitdefender ranked #1, Kaspersky ranked #2, while F-Secure ranked #4.
protections features of the product can be used to prevent infections. In the world’s most famed AV-Comparatives Whole Product Dynamic “Real-World” Protection Test in 2015, the 3 products we recommend both get very high score, as illustrated in the graph below. 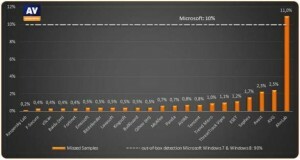 And in the German-based AV-Test, one of the most respected third-party test labs, 25 internet security software are put to the overall ability test using windows 8.1. Only two packages were able to score the maximum total of 18 points, namely the solutions from Bitdefender and Kaspersky Lab, another product we prefer – F-Secure scored 16.5, #4 in the ranking. The best free protection package couldn’t manage any higher than 5th place. OUR TIPS: You may also notice Avira Internet Security, an award winning software from German Digital-Security Company, is extremely eye-catching in some of the above tests. We do think highly of Avira, but we are trying to recommend the top 3 security software for our readers, if there is a place for #4, we will recommend Avira for sure. To give our computer systems full protection, security programs need to load on systems at a very early stage, and keep running as daemon services. Some features like standard file scanners or on-access scanners take up considerable resources when running. A good security product should not bring too much impact to the original system at the same time when it is providing excellent protection. 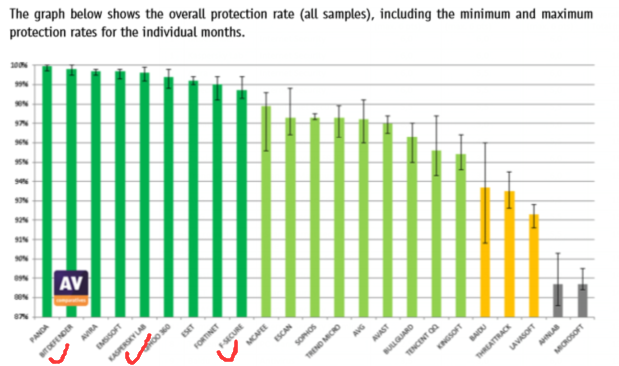 The overall impact scores (the lower, the better) are shown below, Bitdefender & Kaspersky are still the top ones (1.2), F-Secure (10.2) is also acceptable as its impact score is comparative to Windows Defender. OUR TIPS: We suggest consider the defense performance of each security products at the first place. As for system impact, products with scores under 12 are all acceptable. Websites, communities or forums filled with helpful guides and other customer service resources, including a number of warm-hearted & professional users or experts ready to answer your questions. Technical support via real-time online chat. Detailed step-by-step instruction on system rescue in emergency. 1) Bitdefender – Click here for our full review. 2) Kaspersky – Click here for our full review. 3) F-Secure – Click Here for our full review. We encourage you to download trial versions of the 3 internet security suites we reviewed and run them on your own systems for at least one week to compare the above security products on your own, also to test if they are compatible with your existing system & software. We have provided our reviews as a basis, to help you make an informed decision. We have reached the conclusion that Bitdefender Internet Securityshows a distinct lead when closely compared to the others. Bitdefender provides #1 protection with affordable low price, and has the best reviews by a large margin. Now with the big 50% off promotion, you can have your PC protected by the world #1 security suite at only $24.97.